Last night after nearly 10 hours at work (and a 6 a.m. P90X Back & Biceps + Ab Ripper workout), I drove myself to the gym to get in a run. It sounds crazy to add a 6 mile run on top of an already busy day, but it was pretty much the only time this week I could get it in. I’ve really been trying to get in 3 runs/week now that we are increasing our mileage and the half marathon is just a little more than a month away. Since all we are doing to modify P90X is taking Kenpo out and replacing it with a long run ( we will run 10 miles tomorrow), this means I have to do two double workout days per week (I increase my caloric intake on double days by 200-300 calories, which typically includes a 2nd recovery drink). A couple of weeks ago my group run was rained out and our coach sent out an email on treadmill training. I trained primarily on a treadmill for my first half marathon and hadn’t really thought about the differences in treadmill and outdoor running until recently. During my training for the last two half marathons, I got about 1 treadmill run in per week, mostly because it was too dark to run outside alone. However, my coach’s email opened my eyes to a few disadvantages to running on a treadmill that I wanted to share on my blog. 1) Treadmill running is boring. Luckily I had a personal television on my treadmill and was able to watch nearly a full episode of Top Chef; regardless, it’s nice to have the mind engaged in taking in new scenery and navigating while running outdoors. People are likely to run for less time on a treadmill because they get bored and they can easily stop and hop off. Once you run outside for 3 miles, you can’t just call it quits and magically be back at home. You have to run back! 2) It’s easier to run on a treadmill. 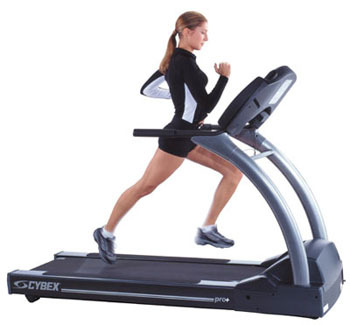 First, a treadmill is very flat, unlike a typical outdoor run which has a variety of inclines. Even if you can’t really tell that you are running up or down hill while running outdoors, your body works harder to adjust your speed. Also, there is no wind resistance to push on you on a treadmill. Although this could seem like an advantage of running outdoors, in the end, you want to burn more calories or train your body to run faster right? We’re not running just for fun – we want results. And all races are held outdoors, so why would you want to train indoors? 3) Treadmills can cause injury. When you run on a treadmill, your legs move forward in the same motion over and over again. When you are outside, you are running over a variety of surfaces and your feet will hit at different angles due to dirt, rocks, etc. On a treadmill, your legs repeat the exact same motion which can cause irritation or injury. Since sometimes it rains in San Diego (shocker I know) and it’s not safe for women to run alone at night, I’ll inevitably be hitting the treadmill a few times during my marathon training. Luckily, there are some ways to mitigate the risks of treadmill running listed above. The main way to make treadmill training more effective and less boring is to do interval training. Never run on a treadmill at the same speed for longer than 10 minutes. You can incorporate a variety of interval training workouts (I will write another blog entry on interval training later but you can easily research routines online) or you can simply just change your speed every 10 minutes. Another way to train on a treadmill is to change the incline of the treadmill. You should vary your incline at least once every 10 minutes. It can be argued that by increasing the incline slightly, the run will be the equivalent intensity of a run outdoors. Here is a chart of the conversion rates for treadmills: http://www.hillrunner.com/training/tmillchart.php . For example, if you are running at 6.0 mph, or a 10 min/mile at 0% incline, it is the equivalent of running a 10:26 pace outdoors ( wow that is a big difference!). If you increase your incline to 1%, you will land yourself slightly below 10 min/mile, at a 9:52 min/mile pace outdoors. Last night I used my coach’s advice. I started with 1 mile at about a 9:30 pace, the 2nd at a 9:00 pace and the 3rd at a 8:40 pace. I sped up during the last ¼ mile to a 7:30 pace for a sprint. For the second half of my workout, I ran mile 4 at a 9:30, mile 5 at a 8:45 and started mile 6 at a 8:30 and finished with a sprint again. My overall pace for 6 miles was 8:55. This is the fastest I’ve ever ran 6 mile during a training run (I have a Garmin watch to record outdoor runs), treadmill or no treadmill, although I’m pretty sure it was partially due to the fact that treadmills are easier to run on. Regardless, I was pretty proud of myself considering I was fairly comfortable with my pace the entire time. I am definitely seeing an improvement in my pace since I started P90X. Basically – use a treadmill when you must, but don’t rely on it if you want to PR in your next race. Get outdoors as much as possible and when you are forced inside, switch up your speed/incline throughout to beat boredom and burn extra calories (interval training is also proven to increase calories burned). Great post! Very imformative. I have found myself doing a lot of runs on the treadmill in training for my spring marathon. Have lost the motivation to run outside. I always boost the pace up to a faster pace then I would if I was running outdoors and add an incline.